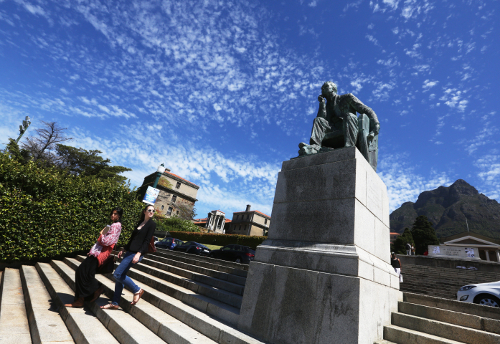 In recent months the spotlight has, yet again, been shone on universities in South Africa. This time, the focus was on the fact that leading institutions (all of whom were previously designated as for “whites only”) remains largely untransformed. This time around, though, the focus was not only on numbers (even though that remains an important component, which others have discussed at length) but also on the curriculum as well as the heteronormative institutional traditions and practices. These practices, members of lesbian, gay, bisexual, transgender, intersex and asexual (LGBTIA) communities reflect, are exclusionary and oppressive. The issue of language, particularly at universities where Afrikaans remains the dominant medium of instruction (and communication), were also raised as a source of exclusion and oppression. In essence, interest groups are demanding a decolonised curriculum (that is: a curriculum that teaches African literatures and theories) relevant to our context as well as globally competitive (this, by the way, is not mutually exclusive); a university demographic that (as far as that is possible) reflects the racial makeup of South Africa; campuses that welcome and promote gender diversity and the freedom of sexual expression, as well as a concerted effort particularly by university managers to destabilise patriarchy at their universities, and finally; universities that encourage (or enforce?) language policies, which include (rather than exclude) communication and critical engagement. The demand that universities have more inclusive language policies, in my view, does not require further debate. It’s pretty straightforward and I am flabbergasted that universities fail to see the urgency of the matter. Being able to communicate and engage intellectually is crucial for teaching and learning. In the same vein, I don’t think English is the answer. Similarly, I am not suggesting we discard English, but I am proposing that we recruit and train academics to be multilingual (in at least three of the dominant languages of a particular province). In this way, both academics and students can express themselves in a language they feel most comfortable in. For a student from a small Karoo town that may well be Afrikaans, or a student from rural Eastern Cape that may be isiXhosa. It is an educational imperative that teaching and learning takes places in environments that encourage dialogue and critical reflection. This however, can only take place where learners feel comfortable and confident to communicate. To that end, schools, colleges and universities should begin a process of introducing teaching and learning in indigenous languages. How about teaching Maths in isiZulu? Physics in Sesotho? Geography in isiXhosa? Teaching medicine in Swahili or sociology in Tshivenda? Language, however, goes beyond teaching and learning! It’s about attachment and belonging — it’s about feeling at home. To illustrate this, Máiréad Nic Craith in her book, Narratives of Place, Belonging and Language: An Intercultural Perspective reflects on immigrants from Asia and Africa mimicking how “Londoners” spoke and pronounced their words in order to fit in and belong. The same happens at universities across the country — particularly those currently under the spotlight. In fact, it’s a common joke on the Cape Flats to tease those who went to UCT about how they speak English when they return home during weekends or vacations. It’s about how they say the “R” word. Upon returning from UCT folks now pronounce the “R” as if it rolls from the tong (like a silent “R”) — like white people do. At UCT (at least in my day) the majority of students were white English-speaking folks. I suspect my peers from the Cape Flats, like the immigrants in London of which Craith talks about, were mimicking their white counterparts, in order to fit in — to belong. At Stellenbosch University, I recently found myself eavesdropping a group of coloured students (I assume they were from a nearby township) poking fun at one of their peers who “suddenly speaks Afrikaans like white people”. They were joking about how the said student would “oorond” their words. I could not contain my laugher, because many of my peers did the same. This was a déjà vu moment. I realised once again that language operates at multiple fronts. For the students I mention above (more so for their peers, I guess) language and particularly how they spoke, was important to fit in. In South Africa — a racially polarised society — black people’s intellect and personhood are often judged based on their ability to speak either English and/or Afrikaans. This is rather shallow, extremely racist and highly problematic — but I shall return to this another time. Why, I asked myself (then, and now again), did students feel the need to fit in. Why did they have to go through so much trouble just to belong? Judging from the stories, it’s clear that students are fed up with accepting their heteronormative (environments that privilege whiteness, heterosexuality, middle-classness, English/Afrikaans etc) universities. It seems students who are black, poor and who do not subscribe to gender norms are particularly isolated in such spaces. These students refuse to continue mimicking their white counterparts. They are demanding spaces that allow them to be themselves. They want to be taught a curriculum that recognises their humanity and their ancestors’ contribution to “knowledge(s)”.They want to love and be intimate with whom they choose. Getting accepted into university and completing a degree is challenging enough. Why add all the other unnecessary crap? I think universities benefit more from students who speak and look differently, hold different ideological/religious views of the world and embrace the plurality and complexity of society.